Peter Drougge created the animation for the Win8 version and I just took it from there. One improvement in version 1.5 is that the rolling and randomizing is performed on the server instead of at the phone. I hade to implement this to prevent cheating when the game is out on more platforms. If I hadn't, then a player would have been able to roll three rolls on each platform and then submit the best score to the server. Big no-no. I added sounds - one sound for rolling and a small applause when rolling Yatzy - and I added shake-to-roll functionality. Both sounds and shake-to-roll can be switched on/off in the Settings view. I figured I should have those features to make it all a little more professional. One user has complained about the sounds muting the music player on the phone. He is right and I hadn't tested that. It shuts other running sounds down and I should come up with some better idea. I use mp3-files and the Xna.MediaPlayer object for the app-sounds and I suppose that's just how the MediaPlayer object works. I'll look around to see if there is another way. So far I haven't found any other way to play mp3-files and I am reluctant to ship the app with non-compressed sound files because of the size. The left one is the default icon, and the right one is the tile icon when you have new unread chat messages. I am not sure if this is going to be the background color, but I really like the look of the actual icons. Also, I added some more statistics for premium users. The current all-time-high top list is very static and I added daily and weekly toplists along with push notifications to players making it to one of the lists. Yes, it is a cheap shot in trying to make more people buy the app but it adds a little value which I would like to have if I paid for it. The new version is not approved yet but I think it will be soon since it isn't that much new functionality in it. Two of five webservers stopped responding today. DiceFeud runs on a very cheap web hotel and there are loads of applications sharing servers so sometimes the servers act strange, but it is out of my hands. I must say that I'm pretty happy with what I get for the money though. There are five web servers in a cluster and my sites have separate app pools which I can control on each server. Last night, two of my app pools stopped and didn't go up again. I don't know what caused them to go down but I didn't notice the problem until I got notified by about it from a dutch DiceFeud player. A restart fixed the problem and it has been working since. I'll keep a closer eye on it over the next few days. Time flies when you're having fun. The last few weeks have been busy and I haven't been able to do much work on DiceFeud. However, Peter Drougge, has been hard at work on the Windows 8 (or Windows Store) version of DiceFeud and the app was submitted for approval five days ago. Peter has done pretty much all of the development himself, with help from Dennis Skantz and me and DiceFeud now has three contributors. The API is of course the same for both the Windows Phone and Windows 8 version but the look and feel of the Windows 8 app is quite different from the Windows Phone version and it has been a blast to watch the progress. We were hoping to have the app approved in time for the world wide launch of Windows 8, but it doesn't look like that's gonna happen. In a perfect world it will be out in the store on october 26, (normally the process takes seven days) but Microsoft said apps needed to be submitted on the first days of october to have a chance since these are busy days for them. Where does DiceFeud go from here? When the Windows 8 version is out, we need to think about what to do next. Sadly, I haven't been very active promoting the app lately so the number of downloads has dropped radically even thought there are hundreds of games being played every day. Since this is my first app, I didn't know what to expect, but it is clear to me now that you have to be very active to keep the interest up. When the app disappear into abyss of apps on Marketplace, your only option is to market the app yourself. I think DiceFeud is a pretty decent app, but word of mouth only does so much and the Windows Phone community is still to small. Pick up marketing of DiceFeud again. Contact WP7- and Windows Store sites and blogs and try to make them notice the app. Use Facebook, Twitter and whatever to mention DiceFeud. If you like the game, please help out. A DiceFeuder will never walk alone! Add missing functionality to the Windows 8 version. Most urgent is the chat functionality which we didn't have time to finish yet. Put a little polish on the Windows Phone version. 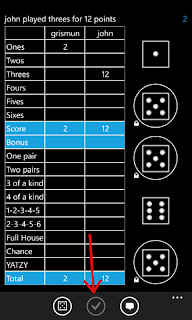 The Windows 8 version has animations when rolling the dice and a few other nice things which we will implement on the Windows Phone version as well. The statistics will be more extensive, with a monthly top list. Hopefully this will trigger people to play even more. There are a few tiny bugs to fix and people have asked for a shake-to-roll feature. Start on an iOS version of DiceFeud. This is something I really look forward to and hope to get started on before year end. Tomorrow I will be at the grand nordic launch of Windows 8 in Stockholm. I hope there will be beer. The new version is out now and it looks great. Big thanks to Peter Drougge for layout improvements. There is also a high score list and your basic statistics, but only in the premium version. I have to try to add som value to DiceFeud Premium since the ad revenue from the free version is virtually nothing. Now that Marketplace has taken off, with more that 100 000 apps available, your app don't show as many ads as it did before since all apps using the Microsoft Advertising component seem to compete for showing ads, and the ad sales haven't increased as much as the number of apps have. Exciting times for DiceFeud. The app is taking it's first baby steps towards a Windows 8 desktop version. More on that when we have something to show. Now go download the new version. Two weeks after the first version was released, and updated version was posted today of both the free and premium versions of DiceFeud. -Improved look and feel on main view. -Added sorting on Last played on main view. -Chat now scrolling to bottom. -Chat message now stays in textbox when loosing focus. -Chat bubbles in different colors for you and your opponent. -Added confirmation before setting score. -Finished games now removed after one day instead of two. -Accent-colored tile and application icon. -Added Statistics and Top list to paid version. -Added refresh button in menu bar instead of in menu. -Rematch-option added in context menu on Finished games list. -Changed message when final scores are equal from "Tie! Noone won." to the friendlier "Tie! Everybody won!" -Important messages may be shown in client on startup. -"Rate this app" link added. Minor changes, but the app looks better and the confirm button was an important improvement because people somtimes taps the wrong slot on the score board and in the first version, the score was instantly saved when doing so. Most annoying when you roll a Yatzy but accidentally tap Chance. 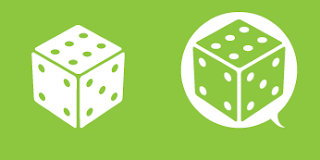 Right now DiceFeud has been downloaded 927 times, but that number is one week old. Since then, DiceFeud was mentioned on a dutch Windows Phone site: http://www.wp7.nl/20279/dicefeud-verslavende-yahtzee-variant-windows-phone/I sent an email to them saying I was trying to promote my app and they were kind anough to write about it. Here is a Google translated version. The very same day that article was published, over 100 new users signed up to play and now more people are playing DiceFeud in the Netherlands than in Sweden or any other country. It's all very sweet. 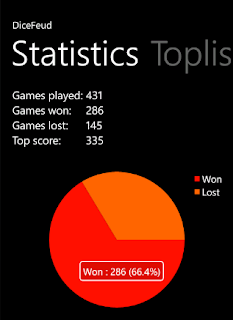 One thing that puzzles me is that from 927 downloads, only 386 users have actually created a user and tried the game. I guess most downloaders uninstall it straight away when they see they have to register to play. All that's needed is username, password and email address (which I will NEVER give out to anyone) and only 40% bother to sign up. Maybe it isn't clear enough what to do the first time you start the app? Or maybe it is because the app is only available in english? I don't know. Translating the app would be interesting but very time consuming and I don't really see that happening. Also, out of 927 downloads, the premium version has been downloaded 16 times. That's 1,7%. I was aware that the vast majority go for the free version, and that's totally fine - I'd probably do the same thing. It is just something to think about if I ever do this again. I guess you need to add more value to a premium version if you want to push your users in that direction. So, the first two weeks haven't made me rich. DiceFeud brings in a daily average of 2 USD on sales from the premium version and about 0.5 USD on ads. It is very rewarding to see people actually playing though. And I still think it's fun to play myself. Stuff about what features are going to be in the next version is there. A couple of good suggestions from DiceFeud players have been posted and if you think of any improvements, please post them on the FaceBook page and I'll consider them. The next version looks very good and I hope to publish it sometime during next week. There are a few animations which brings more life to the app, the accent color is more present than before, and you have to confirm taps on the scoreboard when playing to aviud setting your score where you didn't want it. A full list of new features will be posted here when I am done. There is no link to the Facebook page in the app yet but I think there will be in the next version. I am a little reluctant to add a link because you get redirected to the facebook mobile site, http://m.facebook.com, when facebook recognizes you are using a phone browser, and that site looks like absolute rubbish on Windows Phone. There are now players in twelve countries playing DiceFeud. DiceFeud has now been public for three days. From now on, I thought I'd update the blog from time to time with statistics of downloads, played games and - most importantly - how the app is doing financially. Before I started writing DiceFeud, I was interrested to see if there were any money to be made on the Windows Phone platform. Either there was very little information to be found on the subject or I wasn't very good at finding it. So, if others are looking for that kind of information I'll try to write here about how the app is doing, and if I can figure out how to increase the revenue, I'll share that too. 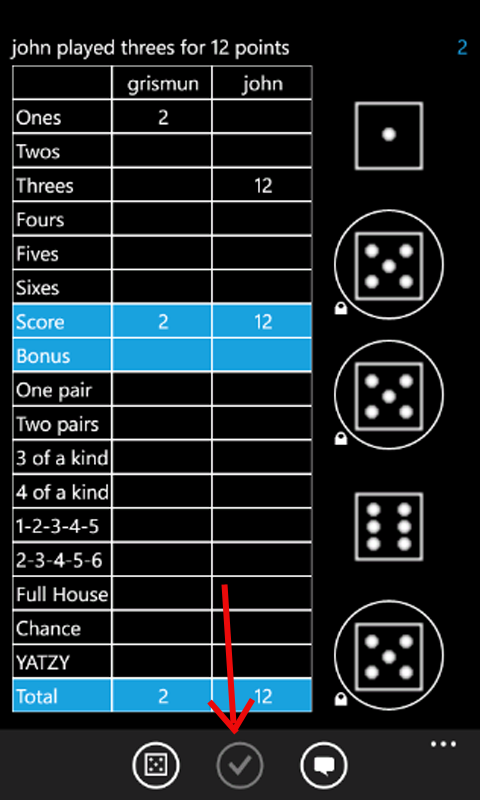 -DiceFeud is only available on Windows Phone. -Today is the third day DiceFeud has been available for download on Marketplace. -It is published in all available countries. That's about 60 countries right now. -The ads are served from Microsoft PubCenter through the ad control which you just drag onto your project. -I have spent about 130 hours on development. -I have bought an SSL certificate for about 167 dollars. -The web hotel costs me 9 dollars a month. Over the last three days, 170 players have registered. That's more than I had hoped for. The Marketplace statistics on how the app is doing are trailing a few days so I can't really see how many people have bought the premium version, but four players (yes, three of them are friends of mine) have told me they did. That's 8 dollars. A qualified guess is that all other players are using the free version. In three days, I have made 12.27 SEK. That's 1.5 dollars. Now, when you set up your ads, you choose up to three categories and "These categories set the general guidelines for what types of ads appear in your ad unit." I don't really understand what this means. Should I categorize my app, or tell the system what ads I want in my app? I had only set up one category, and I added two more an hour ago. We'll see if that boosts the earnings. Anyhow, the bottom line is that you seem to need one hell of a lot of users to make a living on ad revenue. On the other hand, you need a pretty good app to be able to sell it. It would be interesting to see what would happen if the game was available on iOS and Android as well. Since it is a game where you play againts your friends, the app would really benefit from being cross-platform. I'll start on an iOS version shortly and hope I can make time to finish it. The only marketing I have done is on a swedish Windows Phone group Facebook, where people have been very friendly and supportive, and on Twitter where I have 8 followers. (Yes, eight. HardConsulting is the worst twitterer ever). I would need to figure out a way to reach out to a wider audience but I am not sure how. Suggestions would be greatly appreciated. Programmer living in Stockholm, Sweden, with my family. Focusing on .NET and distributed systems. The blog is about a game, DiceFeud, which I started writing for Windows Phone in spring 2012.